A pool cue wrap is a piece of material you slip around your stick to ﻿give increased grip to your shooting hand. It’s often the first piece of equipment that a new pool player buys for him or herself, so if you’re doing research on them, you’re off to a great start. If you love pool and want to be a better shot, read on! 1 Do I need to use a wrap? Do I need to use a wrap? By and large, if you’re p﻿laying pool serio﻿﻿﻿usly, you should be using a wrap for every shot. It’s sort of like how you prefer to use your own stick whenever possible - you want to use the pool cue wrap that suits how you play, and you want to make sure you’re using the same wrap every time for consistent sinkers. You can get away with not using a wrap if you buy a stick that’s coated with a special type of glaze. The glaze provides extra friction, and if you’re sweating bullets during your shots, the glaze will help wick the water away, too. When purchasing, keep in mind that your gamep﻿lay is o﻿nly as good as you are, no matter what equipment you have. So if you’re buying a wrap and expecting to get substantially better overnight, you might be in for a disappointment. But rest assured that a wrap is a solid accessory to have, and using one might make a noticeable improvement in how you make shots. If you’re definitely buying a pool cue wrap, you’ll do a basic product search and be overwhelmed with the amount of variety in the type of material you can choose. The below will give you an overview of each. Rubber wraps: A rubber wrap is literally just a piece of rubber you put over your cue. It’s not the most elegant solution, and in general, using rubber doesn’t offer the most precision out of all of the materials listed here. But rubber is very cheap, resilient to beer spills, and can offer plenty of power. Leather wraps: Right in the middle of grip and no grip. 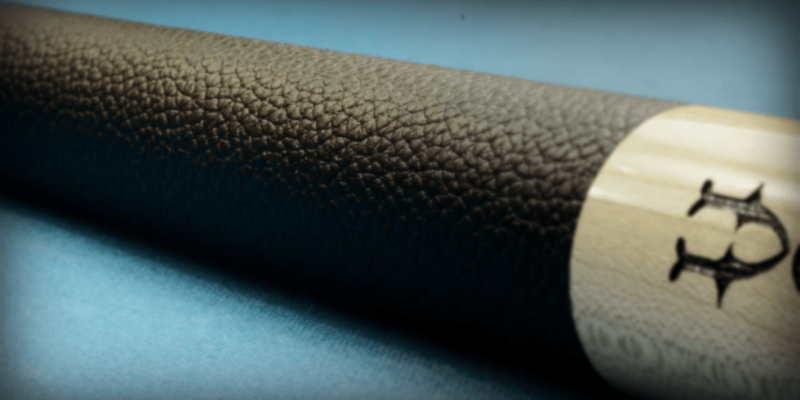 Check out our breakdown of leather cue wraps on this page. If you hit hard shots, you might be suited for a rubber wrap, a specialized stick that doesn’t need a wrap, or maybe a leather wrap. You want a firm grip on the stick so you can hit the ball straight with the amount of power you use. But if you’re more of a finesse player, go with a less-grippy material for your pool cue wrap. Irish linen is pushing it, but one of the leather wrap types will fit almost any style of play. Less grip means you can place your shots more accurately, which is what pool is really all about. Though not all companies make wraps along with their other accessories, plenty still do, and most of them ship worldwide. The brands below have the most expansive selection of wraps. If you look through all of them and don’t find one that’s the right material and within your price range, feel free to branch out with a simple Google search or visit to your local sporting goods store. Good luck!